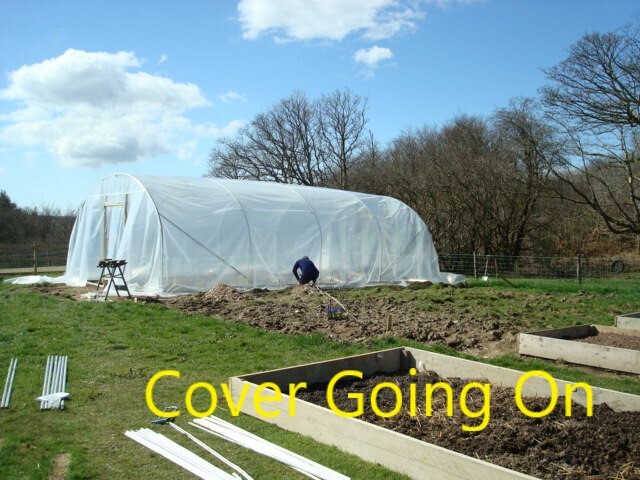 A group I belong to on facebook asked me to do a week of poly tunnel information posts, I started it last night and thought I would copy the info over here I have been putting up as some of you might find bits and pieces of use. Poly Tunnel Erecting and Securing. We live in a very exposed area on top of a mountain in South Wales exposed to all the weather can throw at us nothing to filter the wind and I had my doubts if a poly tunnel would survive up here, but three winters on and they have not moved an inch, shed windows have blown in roofs come off poultry runs blown over and the poly tunnels have not been affected in any way. 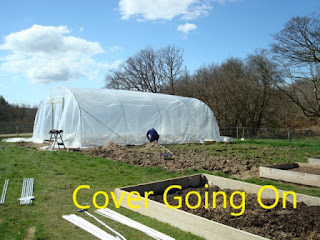 When buying ours we did look around a fair bit, I went with First Tunnels as they always answered the phone and were happy to any questions had lots of how to videos quick delivery in other words there customer service and back up was great, a poly tunnel is a considered purchase. Think about were you want to put it mark out an area walk it pretend its there is it going to work, once up they are difficult to move, you need it positioned to make the most of the low lying sun in winter, were your prevailing winds ( the direction they mainly come from) hit it side on, not close to trees with over hanging branches, not close to tall hedges that are going to cast shade, ideally if you can the two narrow ends facing east to west and the longer sides facing South and North. we then went for crop bars and twin support braces that all help to support the frame in exposed locations. I thought have the folds on the inside so rain water doesn't gather in them, I didnt give a thought to condensation gathering in them and turning into a green algae soup, 2nd tunnel the folds are on the outside, when we change the cover on the first tunnel in about 7 years time we will change the folds as well. Very informative Dawn thank you. Brilliant timing, I was lucky enough to get one for Christmas from my husband and I've been putting off putting it up. We've been told that we need planning permission in our area (national park) so we'll be delayed a bit, but I shall bookmark this to return to! Thanks Dawn! How long did it take you to put the base and poles in? Great post Dawn. We have windbreak meshing on the back Gable and the front door is made with windbreak material too. It's survived lots of gales. They are great for somewhere to garden even if it's raining. So most days lately. Aluminium base rail makes it easier when it comes to replacing the cover, if you bury you will have to pull it all up out of the trench, also the base rail gives a tighter fit, pulling the cover taught and keeping it tensioned.